Standing up to demands for perpetual privilege, WSDOT has informed the city of Mercer Island that its 40-year special access to high occupancy lanes will end in June. At that time, the I-90 express lanes will permanently close for the 6-year construction of East Link, and additional HOV lanes will be added in the main roadway between Mercer Island and Seattle. Like everyone else, Mercer Islanders will be required to meet the HOV-2 standards to use the new HOV lanes. Back in 2015, we wrote in no uncertain terms about the sense of entitlement embedded in Mercer Island’s demands for mitigation from the scourge of high capacity transit. Those unprecedented demands included permanent SOV access to HOV lanes, permanent exemption from future I-90 tolling, resident-only parking at the Mercer Island Station, complete abandonment of bus transfers on Mercer Island, and even dedicated and guaranteed seats for Islanders on Metro and Sound Transit buses. The parties agree that the transit lanes shall operate initially in a two-way directional mode, at no less than 45 mph average speed, with the first priority to transit, the second to carpools, and the third to Mercer Island traffic. Note that this special entitlement is both the lowest priority and only applies to the transit lanes themselves, and does not indicate that these privileges were in any way transferable to the outer roadway. Accordingly, in its February 1 response letter, WSDOT makes two claims: (1) that SOV access was intended to be temporary, and (2) that allowing SOV use of HOV lanes would violate federal law and jeopardize funding agreements. The Good: conversion of the new I-90 HOV lanes to High Occupancy Toll (HOT) lanes, which would allow Islanders to have SOV access in exchange for something they have in abundance: money. The median home on Mercer Island is $1.3m, and median family income is $154,000. The Bad: building a new ramp from Island Crest Way to westbound I-90, adjacent to the east entrance of Mercer Island Station near 80th Ave NE. This would likely cost $60m or more, and possibly require some station redesign. The Ugly: Getting rid of HOV lanes entirely and returning I-90 to exclusively general purpose lanes, even though WSDOT admits this would contravene “regional mobility goals” and likely require repayment of federal grants. In the short term, Islanders will lose their special access in June, and any future SOV accommodation would have to go through the full array of environmental review, cobbling together funding between various bodies, and the alphabet soup of agency approvals. Though Mercer Island is losing a uniquely privileged asset, the impacts are real and sensible mitigation is appropriate, including much greater frequency of Route 204 up and down Island Crest Way. 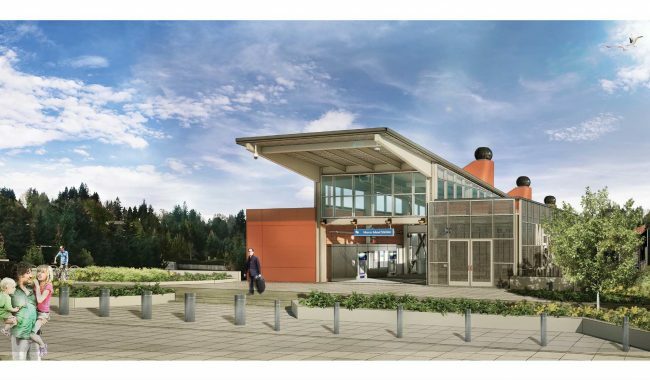 But I humbly suggest that Mercer Island see their future Link station less as an impact deserving mitigation and more as an asset deserving of gratitude. I think you’re kind of burying the lede here, which isn’t so much the special access to the HOV lanes (which I agree is BS that isn’t contemplated in the 1976 MOA), but that the Island Crest onramp for GP westbound traffic will close as it feeds into the now-HOV-only left lane. That ramp carries the bulk of the traffic off the island, and it is going to be quite an adjustment to funnel all of that traffic to 76th. I anticipate significant delays for the 550 and the 212 as North Mercer Way clogs up with freeway bound traffic. I’m not saying a $60m ramp is the right answer, but some sort of mitigation will be needed. To me, this is the real issue. Access to the Center Roadway (Express Lanes) was always going away eventually, and special access to the R8A HOV lanes was never going to happen due to the 45 mph provision. But the ramp changes could be truly detrimental and absolutely should be mitigated. Closure of the Island Crest Way ramp to the westbound I-90 mainline was not analyzed in any traffic study backing the R8A or East Link environmental documentation, so arguably this closure, while keeping with FHWA direction, cannot/should not happen until the impacts are analyzed. I would not be surprised if the City of Mercer Island litigates this, and that presents unknown risks to the East Link schedule. Being casually dismissive of Mercer Island’s concerns, especially the ramp issue, is not helpful. You’re quite right: I was just looking through the FEIS and this major operational change isn’t considered at all. All traffic impact analysis in there assumes this ramp is still open to all traffic. I imagine that they didn’t want to poke the hornet’s nest by telling islanders they wouldn’t be getting access to the new HOV lanes and losing this ramp until they absolutely had to, but that’s a pretty major omission. If I was the city, I’d certainly consider litigating. Worst case is WSDOT has to do a supplemental EIS, best case is the state scrapes up $60m to replace the ramp. I imagine a Supplemental EIS will happen one way or another. The problem is that there’s no time; East Link construction is slated to get going in the Center Roadway by June or July, but an SEIS will take… I don’t know, 6 months? A year? And that’s just to identify any issues and mitigation, to say nothing about actually implementing mitigation. They would need to do an SEIS, or at the very least a low-level Environmental Assessment (EA), to build the new ramp. So I don’t know where this ends up. But litigation injects a lot of uncertainty for everyone. Worst case is litigation drags on, then a SEIS is necessary, followed by implementation of mitigation, all the while delaying East Link. Best case is WSDOT/Sound Transit throw some “mitigation” money at Mercer Island (for parking or extra bus service or whatever) right now and also agree to spend the money on a ramp and fast-track it through environmental review, design, and permitting so it can be completed in a few years. I know a lot of Islanders who see conspiracy theories left and right on this, and while I don’t think that’s what is occurring I definitely see a lack of will on WSDOT and ST’s part, combined with some willful blindness on MI’s part, to really figure out what should happen before the 11th hour. The left-entrance from Island Crest Way to I90 is already dicey for both on-ramp and left-lane drivers. Allowing SOV entrants who would then have to merge quickly into other, presumably crowded lanes seems a recipe for congestion in the toll lanes, and might be dangerous. There may also be some smaller-scale steps possible to accommodate traffic from Island Crest Way to the 76th Ave entrance – one-way some of the streets, add signals at some stop-sign intersections…Are you aware of any studies the city has done along those lines? @Zach – don’t know if that was a piece of snark, or a serious proposal to means-test infrastructure projects. The more I think about it, maybe making N. Mercer Way one-way westbound between ICW and 76th temporarily is the answer. Once the new EB HOV ramp to 77th is open, you could move the transit center bus stops to 27th on the south side of the freeway and get the buses out of mainline freeway traffic, and two lanes headed west on the north side of the freeway would give a lot of space for cars to queue at the ramp meters. I spent a bit of time digging around to understand this ramp issue with Island Crest Way because it wasn’t clear to me. 1. The ramp from Island Crest Way to I-90 W splits right before it gets to I-90 into service the center transit lanes and the mainlines. 2. The traffic from Island Crest Way to I-90 W to the mainlines enters on the left side of the mainlines. 3. The Left side of the mainlines will be revised into HOV lanes come June 2017. 4. This means SOV traffic can’t use the Island Crest Way ramp onto I-90 W which is major way off the island. So what should be done to mitigate this? Not sure about the legalities, but as an interim measure SOV traffic should be allowed to use the onramp in question so the whole project doesn’t get delayed, but permanent solutions should be investigated. +1. Rather than delay the project, let SOV traffic use the ramp and merge over before the left lane returns to HOV, like on 520 when there’s right-lane HOV. Maybe eventually we can build a new right-side ramp. Yep, that’s the problem. Another case of a left hand ramp causing trouble. And apparently, FHWA will not grant even a temporary waiver for SOV use of an HOV direct access ramp, so that’s not an option. Google maps shows no such split described in assertion 1. Getting to the main highway involves entering from N Mercer Way, if I’m reading the map correctly. The map might not, but Street View does. What? I’m seeing exactly that split on your link; look between 77th and 80th. And, @Ron, that’s very unfortunate if so. But would that really apply to this ramp, because it currently isn’t an HOV ramp at all? We’d just delay/avoid converting it. The map shows a split off further west from the express lane to the regular lanes. But once the express lane is gone, then there is no direct connection between the Island Crest ramp and the regular I-90 lanes. That’s the way I read the map. There’s definitely a split. The Island Crest ramp puts you in the right lane of the WB express lanes, or the left lane of the mainline. At the moment, that’s a GP lane as the HOV lane ends at 80th. When the HOV lane extends across the lake, it’ll suddenly become an HOV direct access ramp as facts on the ground, so I don’t think there’s any way around the FHWA prohibition. So SOVs will have to instead head north to N Mercer Way, and drive through the middle of the transit center to the 76th onramp. That’s a two-lane road and it’s going to be a mess. Thanks for the streetview, Nick! I’ll start a new thread further down about the express ramp. Not all the traffic that currently uses the westbound Island Crest Way on-ramp will go to 76th/North Mercer Way. Some will but others will go to East and West Mercer ways. A number of new signals were identified as mitigation in the East Link ROD. Sound like in the letter that WSDOT and ST are figuring out which of those still make sense as part of the traffic analysis they’re doing. You really don’t have to “make” traffic do anything. You don’t have to make it hard to get to 76th/North Mercer Way, you just have to make it easy to get to Island Crest Way. Drivers tend to gravitate towards the fastest way (it can be self balancing), so you really don’t have to do to much to get them there. Folks also tend to be illogically favorable to surface streets. In other words, someone will sit through a long traffic light, rather than slog along a freeway lane, even though the latter is faster. That is basically arguing for the same thing though — the traffic lights should favor a path towards West Mercer Way as opposed to 76th, which means a lot of time spent with the left turn arrow on (for both Island Crest Way and 27th, as well as 76th and 24th). If you are coming from the south end of the island you could cut over to West Mercer much sooner (like at Merrimount Dr or 40th) instead of going all the way up to North Mercer/76th. What’s the long term plan for buses on I-90? Will there be any buses from Mercer Island to Seattle after East Link, or only Eastside – Mercer Island Station buses? MI to Seattle buses are definitely gone. You’re down to the two ST routes which Link directly replaces to the west when it gets to Northgate, and a few peak hour stops on a route from Redmond/Issaquah. That route and all the other I-90 corridor east buses are almost certainly going to be terminated somewhere along Link. The most sensible proposal is a bus loop at 80th on the island, but that is for some reason controversial. South Bellevue is another possibility, but without HOV direct access from the east, not a good one. Northgate Link opens two years before East Link. It won’t affect east I-90 routes, beyond clearing more space for them downtown. Eventually the ST 550 and Issaquah buses will go away, but not for 7 years, when light rail opens. So in the interim, beginning in July, those buses will be sitting in the one remaining westbound HOV lane. HOV lanes are already congested westbound with the current 2 lanes. Going to one lane as planned will make it worse. Getting rid of the Mercer Island SOV traffic in that remaining HOV lane will help, as would converting one of the general purpose lanes to HOT lanes (not planned). The concern about routing the ST turnaround buses is for when the light rail opens in 2023 (as hoped), so there is lots of time to figure out safety issues and the impact on Mercer Island’s few pedestrian streets in the town center. Eventually, Light rail will eliminate the ST Belleuve bus (which runs about every 10 or so minutes), and, with ST3, the Issaquah ST bus. Short term it will be tough for the high speed bus riders, who have a good deal now. Long term: Link Light Rail line from Issaquah to downtownish Bellevue, via Eastgate. Yippee! Almost as fast as walking. Seriously though, a bus from Issaquah to Mercer Island would be much faster than the three seat ride to Seattle you suggest. Driving to a park & ride, catching a bus, and transferring to a train at Mercer Island is the same number of seats as driving to a park & ride, catching the train to Bellevue, and then transferring to a train to Seattle. Heading west, it enables Issaquahites to grab seats instead of standing. @Brent — So all those people who walk, bike or drive to the existing stops will all drive to the one stop in Issaquah? Sounds like a great plan. Typical trip after ST2 — Rider walks or drives a short distance to the closest bus stop. She gets on a bus that makes a freeway stops at Eastgate before docking in Mercer Island. At that point, she picks up a train that runs frequently from there to downtown Seattle. She walks or drives a short distance to the closest bus stop. From there she rides a bus to the train station. Work has been done on the surface streets to avoid the worst of the traffic (bus lanes right into the station) and she at least avoids slogging through Issaquah before taking the train. Three seat ride– worse than when they had direct bus service to Mercer Island — but still not as bad as driving to the park and ride. Your critiques of ST3 are not terribly related to this post. East I-90 express buses will be running through at least 2041. We have the opportunity to drive a bargain to get a good bus transfer facility on Mercer Island. Mercer Islanders could still find a way to get more use out of the Island Crest ramp to I-90 (e.g. HOT lanes). A little diplomacy is in order. Ross is both off topic and still wrong (sorry Ross). A bus transfers at South Bellevue vs rail transfer at East Main is a wash – the time penalty of backtracking to East main is the same or less the time penalty of wading through Bellevue Way traffic, especially south (east) bound in the afternoon. Link frequency will surely be 15 minutes or better during peak, even if it’s not 4 car trains. I mean, come on, frequency should match that of the worst RR lines. That will make it equal or better than every bus stop on the I90 corridor outside of the Eastgate freeway station. So, basically you are upset someone at Eastgate has to wait an extra 5 minutes during peak, and doesn’t value the improved all day frequency for, say, a student at Bellevue college. Nobody knows yet what frequency the Issaquah Link line will have, but I think it’s reasonable to use the combined frequency of today’s Seattle->Issaquah express buses as a starting point. Back of envelope, I would use today’s schedules for the RapidRide B and F lines as an approximation for what Issaquah Link service will look like when the line opens. Remember, that this is not Sounder service, where every trip requires paying a pot of gold to BNSF. The tracks are, of course, very expensive, but once they’re built, the marginal cost of running a train on them is not much different than the marginal cost of running a bus down parallel roads (maybe even cheaper, due to less schedule padding, as a result of trains being guaranteed to not get stuck in traffic). So, I would not expect frequency on the Issaquah Link line to be any worse than the frequency on the post-ST2 554, truncated to South Bellevue (which, I believe is planned to be something like <10 minutes peak, 15 minutes off-peak, at least until 10 PM). When can we just ditch the whole “HOV” nonsense and turn them into bus-only lanes? After 2023, there won’t be any buses using the lane. If Mercer Island decides to crash the economy of what passes for their downtown and not allow bus transfers there, then the buses will end up terminating at South Bellevue Station. Until 2023, it would be nice to have those as bus lanes, for sure, or 3+ HOV lanes at least, or sell specialty Proud Mercer Islander license plates for which the governor signs an executive order not to enforce the HOV law for anyone who has this plate. But charge a large sum for this plate, with proceeds to help build the replacement Island Crest ramp that connects to the inside lane of I-90 west. I mean in general, not just Mercer Island. And I think 3+ has similar enforcement issues to 2+. I think HOV lanes should go bus-only as a huge enticement for people to use buses. I’m with Brent on this one. It really depends on the road. When Link covers much of I-5, or Mercer Island to Seattle, you might as well keep it HOV-2. With 520, HOV-3 is fine. With other roads that simply don’t have that much traffic (e. g. Issaquah to Mercer Island) HOV-2 is probably fine. If not, then simply convert it to HOV-3 (or HOT). Ross being with me feels like Texas A&M confirming cold fusion right before the University of Utah admits their data was bunk. And so, I got it wrong. The ramp I mention above already exists. And about that bus and/or HOV 3+ lane? It ain’t going to work in the stretch after that ramp merges into the HOV lane. I regret my previous ignorance. 1) Buses don’t run on the road. 2) Congestion is low enough that it doesn’t matter. In either case it sounds quite reasonable to keep the road HOV-2. Are you arguing that point? As to the particulars in this case, it is quite reasonable to assume that the section from Mercer Island to Seattle falls in that first category. So basically all you have to worry about is whether traffic (due to allowing HOV-2 vehicles) backs up so bad that it interferes with buses on their way to Mercer Island. If not, then this section could remain HOV-2, while the section further east be converted to HOV-3 (or bus only). The exact same situation will, of course, exist a couple years earlier, when trains get to Lynnwood. What I’m retracting is my assertion that the HOV lane could work as a bus lane between now and 2023 or so. I didn’t realize the Island Crest Way ramp fed directly into the HOV lane. Forcing most of the traffic from that ramp over to North Mercer Way is not only counterproductive for buses, but comes with a non-trivial carbon footprint. Ross, I can’t believe you used Issaquah to MI as your example of a road with not much traffic – I’d assume you are trolling but that’s not your style. The HOV lanes between Bellevue and MI frequently grid to a halt if the express lanes are not open. GP lanes are stop and go throughout the I90 corridor, not just MI. WSDOT cares about much more than the ST district – there is a significant amount of traffic coming in from Snoqualmie and North Bend into Seattle. After you convince WSDOT to turn the HOV-2 lanes to HOV-3 lanes. When hell freezes over. Or we get a Democratic legislature, whichever comes first. The Democrats aren’t as universally pro-transit and pro-urban as that. It was Frank Chopp and Democratic as well as Republican legislatures that limited how much Metro and the other agencies and the cities could do over the years, and didn’t contribute to regional transit, and left rural counties with their skeletal–to-nonexistent transit, and replicated Eyman’s tax caps after the courts found his initiative unconstitutional.Some Democrats want to do the transit and carpool thing; too many want to perpetuate car privilege. It’s already HOV3 on 520, so He’ll already froze over. The folks on Vashon and Bainbridge Islands seem to cope with long lines of cars getting into Seattle by either bringing a book/device in their car to use on the “bridge” at the ferry terminal, or walking on to the ginormous transit vehicles awaiting them once/hour. Mercer Islanders will adjust just fine over time; with some tears and gnashing of teeth I’m sure. Anyone who bought there after 1970 knew this was coming, right? Well, yes and no. East Link passed at the ballot box in 2008. I don’t recall how the vote broke on Mercer Island. With a ferry people expect a line and waiting. With a bridge they don’t. That’s why they built the bridge. No to mitigation for lost HOV access. Mercer Island, of all places, can afford to improve its own local streets, and has had forty years to prepare for this change. That said, mitigation can be a tricky word: improving service (like increasing frequency for Route 204) to meet increased demand is really just a transit agency doing its job, not a quid pro quo mitigation. Increased 204 service would really help, but increased demand DOES NOT results in increased service as there’s not enough transit funding. There’s also an awful lot more of them than there were in the 1970s. It’s not as if it is a few scattered cars that originate there. They’re a real suburb now and it’s time for them to have the same restrictions as all the other cities that have grown too. Thanks to Nick’s streetview, reality is a little more clear to me than it was yesterday. Buses will be impacted significantly if the vast majority of Mercer Island traffic is diverted onto the crawl by the park & ride. If SOVs could still use the very expensive investment, already built, that is the Island Crest Way ramp leading to the left lane of I-90 W, and then have a reasonable amount of distance to move out of what will soon be an HOV lane, that seems far better than making the commute for 550 riders even worse. Or messing up the ability to have a functioning transfer center circling the future Mercer Island Station. If legal technicalities are a problem, then have a certain distance of the left lane not be designated HOV. If that is illegal, make it legal. But as part of the deal, let off-island buses have their light rail transfer center. After 2023, there will be no public buses using the HOV lane between Mercer Island and Seattle. At least don’t ruin bus riders’ commute even more for the sake of counterproductive principle. The problem is that the FHWA approval for the whole project is premised on the HOV lane running all the way through the island. You’d have to redo the whole EIS to change that, I expect. Huge delays, knock East Link off schedule. And I think you’d have problems convincing them that an HOV lane that ends and starts again in a mile is safe, left hand onramps are disfavored to begin with let alone ones that require most of the traffic to immediately merge out of the lane they just entered. And changing the law would be a real Pandora’s box situation at the moment: could you see Congress/the Administration declaring that HOV lanes discriminate against hard-working single occupant drivers and opening them to all traffic by fiat? I could. I could see Governor Inslee providing a private reassurance that SOVs will still be allowed on the approach ramp, and the HOV lane will not be enforced (for everyone, not just Mercer Islanders) between the merge and the west coast of the island. State Patrol can stand down from enforcing that section of HOV lane. Zach, it seems like WSDOT should study more than those three options. First, the new outside HOV lanes may degrade at two-plus, so three-plus should be studied. Second, perhaps the optimal answer is to apply variable tolling to all the lanes. then MI users would have access to all lanes; everyone would pay. So, that would sum to five options. Of course, WSDOT would need that last option blessed by the Legislature and Governor. North Mercer Way is used by transit in both directions, so how would making it one-way work, as one commenter suggested? If it stays two-way, how will transit be insulated from the increased traffic? Time is short. The pre-2023 period was always going to be the most difficult. Transit flow will be degraded by the loss of the center roadway (peak direction) and the D-2 roadway, and Route 550 will lose access to the DSTT. South Bellevue parking will close. Ouch. This reminds me of the criticisms of the straw man option in the East corridor mode selection; ST staff asserted that a rail-convertible BRT would have to shut down for the conversion to rail. Well, as it turns out, the choice of Link has not avoided serious degradation between the R8A and D-2 events and East Link’s opening in 2023. Re: Transit on North Mercer Way. I’d go for the Seattle 4th Ave Solution: A single bus only lane eastbound at that location. It’ll still be a bottleneck, but that gives two traffic lanes and one bus lane westbound. So what so special in the islanders besides their high (average) income? Nothing. So I’m glad they’re loosing their exclusiveness. Only hope sooner than later. This is good news and long overdue. It really was a bit indefensible that MI residents had such privileges that were unshared by any other residents in the region. Even the “2cars per green” priveliges for the flow metering onto EB I90 was unique to the region (as far as I know). First, despite MI whining, the ICW ramps to WB I90 will still be available to MI residents. The only change is that they will become HOV only lanes. This is inline with the rest of the region, and should encourage HOV and transit use. Second, not all traffic will attempt to access the freeway at the same spot, some will disperse to the other access points on the island. As a note, LH HOV only access to LH HOV lanes does not present a traffic flow problem on the freeway, whereas LH GP access to LH traffic flow lanes would in all cases where the GP traffic does not have travel rights to the LH lane. Giving MI GP traffic access to the LH HOV lane should be avoided as it would trigger expulsion under the 45 mph clause of the original agreement. So, this is a good thing all around and is inline with the original agreement. The only reason they got the freeway and are getting light rail is they’re “on the way” between larger cities. The best route between Seattle and Snoqualmie Pass went through Lake Washington according to the engineers that built US 10. Otherwise there would have been no bridge or easy commuting or lucky express bus stop or light rail station. The agreement for Mercer Islanders to use the HOV lanes was probably because the highway had more capacity than they knew what to do with, so why not let Mercer Islanders use it until rail was ready. The rebuild in the 1980s turned it from four lanes to, what, eight lanes now? The lanes didn’t fill up until a few years after that, with the Eastside tech boom in the 90s. Ya. MI got lucky in that MI is on the straight shot from Sno Pass to Seattle. The alternate route would have been to essentially follow the route of the old Milwaukee Road into Renton and then up to Seattle, but Renton is out of the way if you are going to Seattle, and nobody really wants to go to Renton anyhow. Bottom line, MI got lucky with their location and their resulting good transportation options. They actually benefit more than they are inconvenienced by the current I-90 routing. They should stop whining and just be grateful. It’s not that far out of the way. The highway turns southeast at Lake Sammamish and it keeps going east and southeast all the way to the mountains. If you go straight east from Renton (SE 116th Street) you’d end up in North Bend. There’s hills in between but they could have tunneled through them or something. And Renton in the 1940s was not like Renton today, nor was the Eastside. Renton was a Boeing boomtown, and Boeing workers lived in Beacon Hill and Rainier Valley, Bellevue was all farms and a tiny tiny town, and Mercer Island had some Native Americans on it I think. There was no pressing need to build a bridge over the lake and connect the island, just like commuter rail or a subway could have gone around to Renton and then northeast. And the Bellevue/Redmond “big city” could have been anywhere in the Eastside, including Renton itself or somewhere between Renton or Bellevue, somewhere that would have been shorter for a train or highway going around the lake could get to. It was all farmland so it didn’t matter where they put the city. Why not in north Renton? The 10,000 people in Bellevue might have been offended that their town center wasn’t chosen, but so what? Would all-traffic access to the left lane of I-90 W make traffic worse for more people (not cars, but people, including those on all the buses) than making most of the traffic suddenly have to divert in front of the park&ride? Is there a plan to mitigate the impact to buses? Between the closure of South Bellevue P&R, the diversion of most Mercer Island traffic, the re-route of all the I-90 buses to head by Stadium Station and possibly terminate at International District/Chinatown Station, 550 riders will already be suffering enough. Why throw them under the bus for the sake of sticking to our HOV-lane purity principles? Is there no such think as a not-completely continuous HOV lane? I know there is. We’ve got lots of them around the region, including on freeways. Once the buses stop going into Seattle in 2023 and buses stop going to Mercer Island because a few loud obnoxious people got super-entitled, there will be no off-island bus riders there to care about the impact of diverting SOVs in front of what is currently a major bus pick-up/drop-off facility. At that point, limiting the Island Crest Way ramp to HOVs would make a lot more sense. If we can get the bus transfer facility on Mercer Island, at least until Issaquah/Eastgate/Bellevue Link opens, then I’d be happy to let south Mercer Islanders have an HOT lane to share with the commoners. If they don’t allow the bus transfer facility, I don’t think they should even get HOT access. But cooler heads do need to eventually prevail. Right now, both sides are offering more heat than light. I’d suggest an experiment, sooner than later, of closing the Island Crest Way onramp to SOVs for a week, with a week’s notice, and see what happens to bus flow at and near Mercer Island P&R. So many thoughtful, pragmatic and well thought out replies. We won’t get it right the first time and that is okay. Not everyone will like it, that’s okay too. As the project moves ahead, I hope Zach is able to shape a more productive tone for future challenges. Spotlighting privilege and entitlement is low hanging fruit and it only inflames. It’s insulting to have it draw attention from the well thought out opinions expressed here. What a refreshing and productive discussion compared to the one happening below the very similar Seattle Times article. @Peter It’s one of the more constructive and well thought out threads I’ve seen.